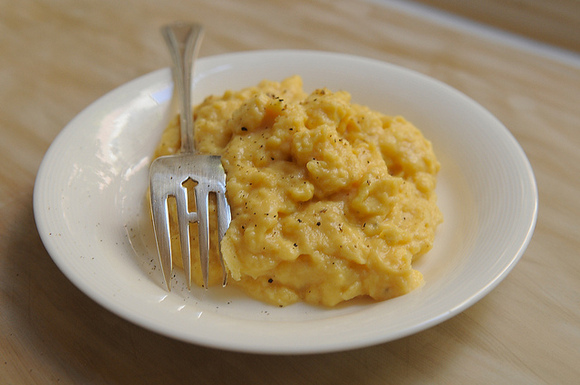 Perfect scrambled eggs you will sure love to make and eat. There is an art to cooking eggs. There are so many ways to prepare them and there is a trick to each of them being done right. One of my first signature dishes to prepare for our guest was, Rosemary Cream Cheese Eggs. Everyone talked about how great they were, I would tell them how to prepare them, they would go home, try it, and sure enough I would get an email saying, “they don’t taste the same”. Most people over cook scrambled eggs and make them dry and rubbery. I cook my eggs on very low heat and constantly stir them till they are still very moist and slightly shiny. Remember, eggs will keep cooking when removed from the heat. I also believe as Julia Child’s taught, everything is better cooked in butter. I have added this recipe that is very easy to follow, it actually came from Food 52, a great website I love to follow on social media. So give this recipe a try, it’s very simple. They didn’t add any herbs, but I am an herb gardener with lots of rosemary so try some in the mix if you like that little extra punch of flavor. I also use our fresh farm eggs with beautiful yellow yolks and I know fresh and organic makes a big taste difference. Let me know what you think of these. This entry was posted in From the kitchen, Herbs in the Garden and tagged eggs for breakfast, perfect scrambled eggs, scrambled eggs by admin. Bookmark the permalink.